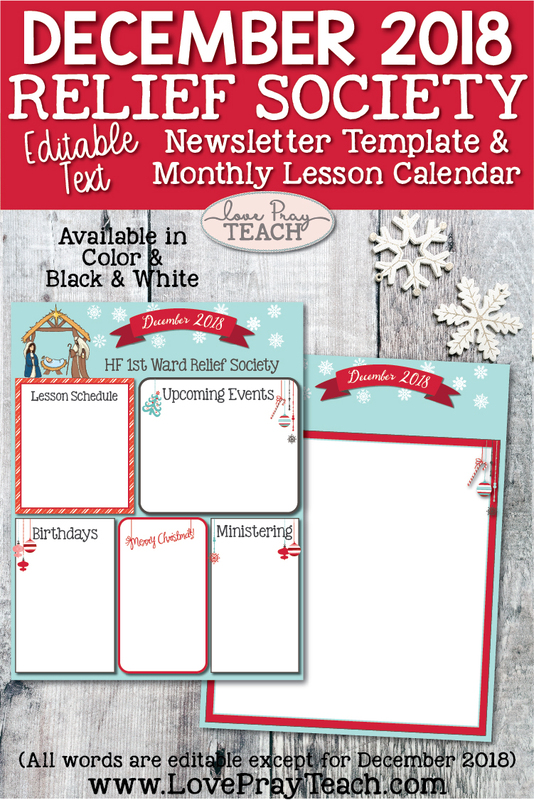 2018 is bringing many changes to the way we teach Relief Society! You can find information on the new format by clicking here. We want to be able to help you in keeping your Sisters informed each month and what to expect. Sending them a list of the upcoming Conference Talks that will be taught, will help them to study the talks beforehand and be ready for a great discussion! Customizable Newsletter: The editable PDF Newsletter is sized at 8.5" x 11" and is perfect for printing and/or emailing. We have included instructions on how to edit - it's super easy! We've included a color version and a black & white version so you can easily print them off at church. 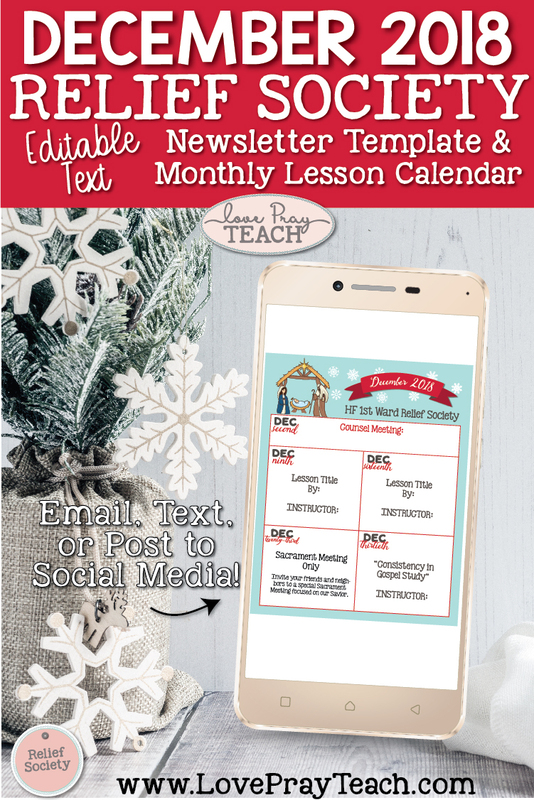 Lesson Schedule Calendar: This editable calendar has spots for each of the weeks of the month. There is room to add the topic for the week along with the instructor. We have sized this calendar to fit perfectly in a social media post like Instagram and/or Facebook! You could also text the calendar to each of your sisters. This is such an easy way to keep everyone informed of what to expect each Sunday! Encourage the women to save the calendar to their phones so they can refer to it throughout the month. We have included detailed instructions on how to edit the PDFs. If you'd like to add your own text in a program like Photoshop or Word, we have also included JPG images. We have had some requests on how to edit the Newsletters in Microsoft Word. I created this video to help you! All words are editable except "December 2018"
All words are editable except "December 2018" and the dates. 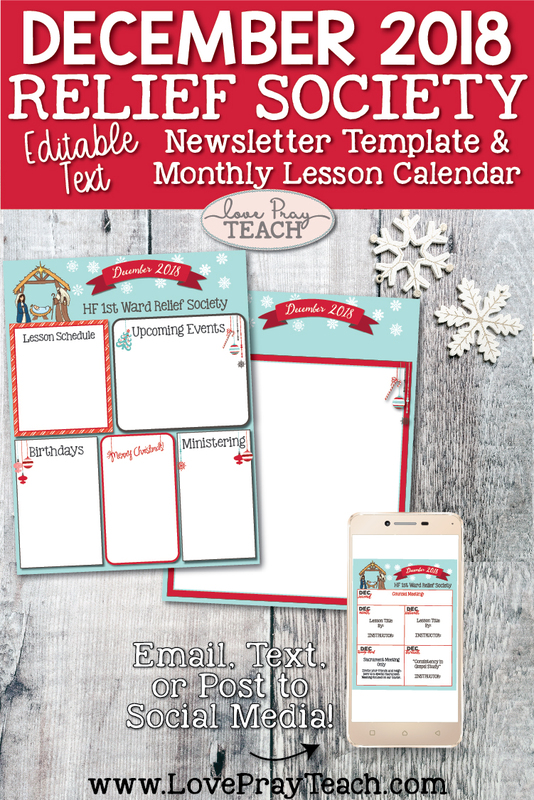 We will be designing a new Newsletter template and Lesson Schedule Calendar for each month! These will be included with our Relief Society Membership! If you are a member, click here to download the Newsletter and Calendar. If you'd like to buy these in our store, click here.